We all know running does the body good, but did you know about these other benefits from running training? Studies show that 30 minutes of physical training every day can improve cardiovascular, respiratory, and mental health. Running for even a short period of time each day can keep bodies younger and healthier and can even extend runners’ lives. Running clubs exist in practically every city. Clubs are great ways for runners to meet people with similar fitness goals and gain support in their training. The proper running gear can make or break your run. Shoes and socks should provide adequate support, especially to the arch of the foot and the ankles. 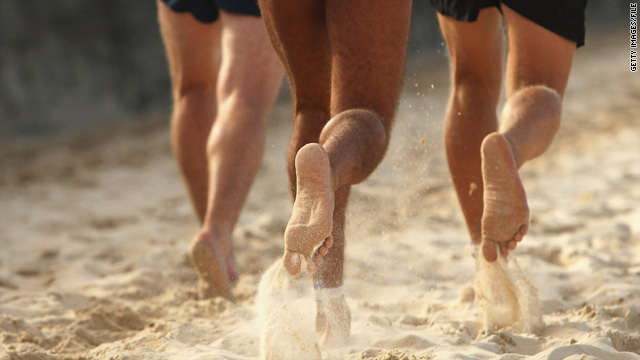 Wearing improper footwear can lead to injury and sore feet during training. Studies show that running in the morning can increase metabolism throughout the day. Those who run in the morning can burn approximately 10 percent more calories throughout the day, which can add up to big results. It seems getting up early can be a good thing. Exercise causes endorphins to be released within the body. These endorphins are natural mood enhancers, which cause the runner to feel naturally happier after training. While most experts say that 30 minutes of exercise is substantial, new studies suggest that only 11 minutes of training can be enough for runners to experience the physical and mental benefits of running. Not only can music keep you from getting bored on your run, it can also increase your stamina and speed. According to runnersworld.com, runners who listen to music during training increased their stamina by 15 – 30 percent. Running buddies are a great way to keep up the motivation to hit the pavement. But, while a best friend might cancel on you at the last minute, your dog will always be up for a jog around the park. Dogs have also been shown to increase mood and keep runners on pace for longer periods of time. Annalee Sine is a writer for Mettis Trainer. She writes for Fusion 360, an advertising agency in Utah. Find her on Google+.